The winners of the PMPC Star Awards For Music 2013 have accepted their respective trophies during the awarding ceremony held at the Solaire Resort and Casino grand ballroom on Sunday, October 13. Leading the pack of winners are Sarah Geronimo and Jed Madela, who won the the Female Recording Artist of the Year and the Male Recording Artist of the Year awards, respectively. Boy band 1:43 bagged the award for the "Song of the Year" for their hit single, "Isang Sulyap Mo," while Gloc 9 took home the Album of the Year award for "Mga Kuwento ng Makata." Meanwhile, "Got To Believe" star Daniel Padilla received the trophies for the Pop Album of the Year and New Male Recording Artist of the Year. 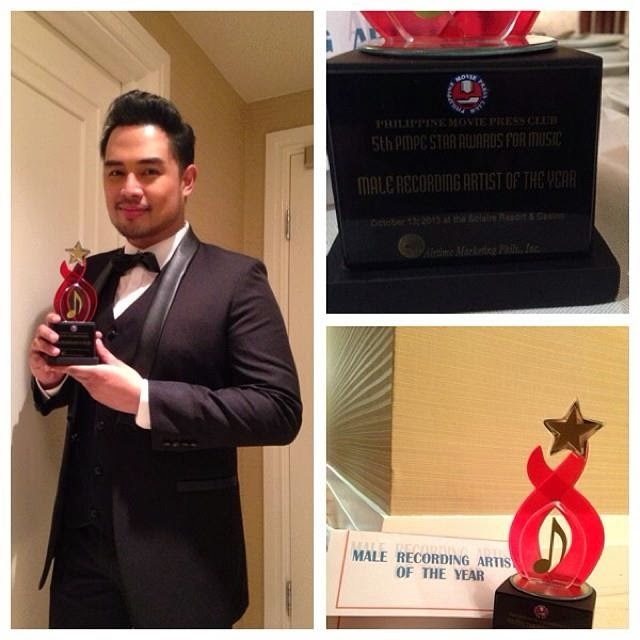 Album of the Year: "Mga Kuwento ng Makata"
Concert of the Year: "Foursome"
Male Concert Performer of the Year: Martin Nievera, "Foursome"
Female Concert Performer of the Year: Regine Velasquez, "Silver"
Male Recording Artist of the Year: Jed Madela, "All Originals"
Female Recording Artist of the Year: Sarah Geronimo, "Pure"
Male Pop Artist of the Year: Marvin Ong, "Sigaw ng Puso" and Piolo Pascual, "Dedades III"
Female Pop Artist of the Year: Jessa Zaragoza, "Pag Wala Na ang Ulan"
Male Acoustic Artist of the Year: Noel Cabangon, "Tuloy ang Byahe"
Female Acoustic Artist of the Year: Princess Velasco, "Acoustic Princess II"
Revival Album of the Year: "The Prince of Ballad"
Compilation Album of the Year: "Himig Handog P- Pop Love Songs"
Dance Album of the Year: "Best of the Teen Pop Idol"
Inspirational album of the year: "ASOP, A Song of Praise"
Novelty Album of the Year: "Dekada"
Novelty Artist Of the Year: Alexis, noypistuff "Arimunding-munding"
Duo/Group Artist of the Year: The Company, "Light Hearted OPM"
Rock Album of the Year: " Metamorphosis"
Rap Artist of the Year: John Rendez, "Metal Dog"
Alternative Album of the Year: Moonstar 88, "This Year"
RnB Artist of the Year: Luke Mejares, "Kasayaw"
Cover Design of the Year: "3D Tatlong Dekada"